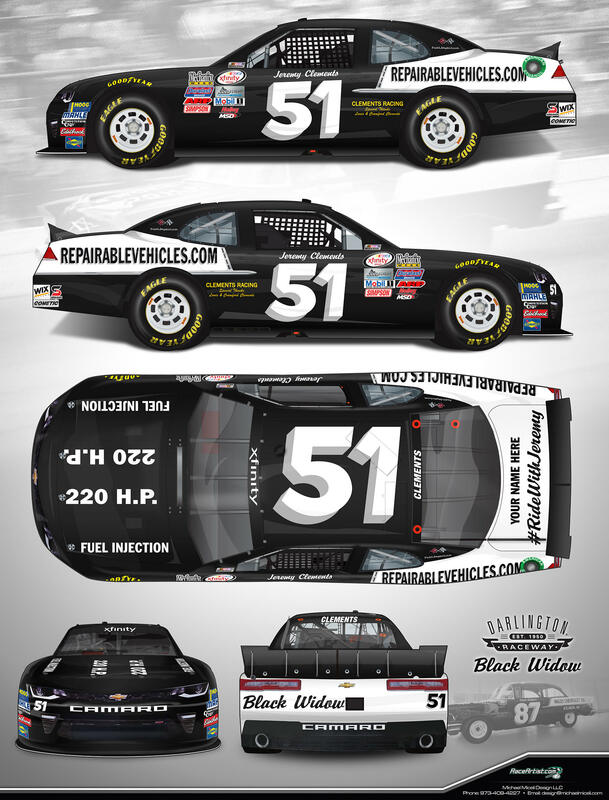 Jeremy Clements Racing is excited to announce they will be fielding a Throwback paint scheme this coming Labor Day weekend at Darlington Raceway, The #51 Camaro SS will be sponsored by long time partners www.repairablevehicles.com and will feature the “Black Widow” paint scheme that was driven by a number of racing greats in the late 50’s in the likes of Hall of Famers Buck Baker and Rex White and powered by the renowed engine builders of the time Jeremy’s Grandfather and Great Uncle, Crawford and Louis Clements. Crawford and Louis both also crew chiefed as well for some all time greats. Crawford crew chiefed Hall of Famers Junior Johnson, Buck Baker and AJ Foyt all to wins the early 60s and Louis crew chiefed Rex White to 1960 Cup Championship. “I’m really proud to honor my Grandfather (who started me in racing) and my Great Uncle with this cool Black Widow Paint Scheme from the 50’s. 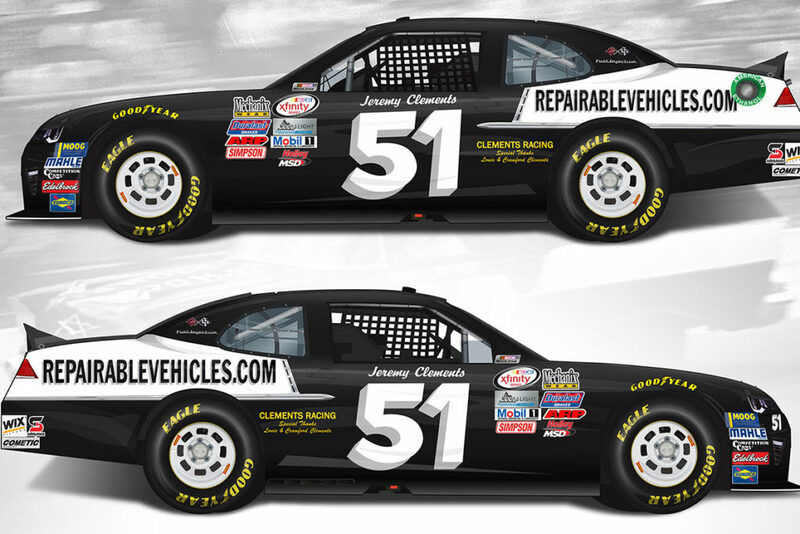 Even more excited to represent them and Clements Racing Engines in our home state at Darlington and have the fans ride along with me.” said Jeremy. Also to coincide with Throwback weekend JCR will offer the ability for fans to #RideWithJeremy in the VFW Sport Clips 200. Please see Jeremy Clements Racing Facebook page for more details. Jeremy Clements will flashback to the 60s with this Outta Sight Gold Thunder design 4 Throwback weekend.